Montgomery, chosen over competing bids from Tuscaloosa, Wetumpka, Mobile, Marion, Statesville, Selma and Huntsville, has been the state capital since 1846, indeed was the capital of the Confederacy for three months in 1861 before that was moved to Richmond, but it was not always so. 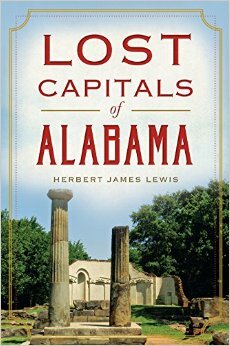 Montgomery is our fifth capital; the other four “lost” capitals are the subject of Lewis’ brief, informative book. The first of these was St. Stephens, sixty-seven miles north of Mobile, capital of the Alabama Territory from 1817-1819. The inhabitants of St. Stephens were described by Land Commissioner Ephraim Kirby in 1804 as “with few exceptions…illiterate, wild and savage, of depraved morals, unworthy of private confidence and public esteem; litigious, disunited, and knowing each other, universally distrustful of each other.” Nevertheless, a capital was constructed and creation of Washington Academy, Alabama’s first educational institute, was approved, to be financed by means of a lottery to bring in the $5,000 needed. The capital was moved in 1819, temporarily, to Huntsville. St Stephens receded into the wilderness. In 1812, Alabama’s second educational institution, Huntsville’s Green Academy, was established: “trustees were authorized to raise up to $4,000 by way of a lottery.” In Huntsville the first state constitution was created. Regarded as liberal for its time, it allowed universal white male suffrage—no property or military service requirements. Lewis reminds us Huntsville did not collapse when no longer the capital but, as a rail hub, did suffer more than any other city in Alabama from repeated occupation by Union forces during the Civil War. Old Cahaba served as state capital from 1820-1824. For a while it thrived. Inns, taverns and boarding houses were opened in anticipation of the incoming legislators. The Arch Street Hotel boasted “the finest liquors.” One of the first acts of the 1824 legislature was to authorize a lottery to raise up to $20,000 for the construction of a Masonic Hall for the Halo Lodge. A pattern emerges. The most remarkable event in Cahaba’s tenure as capital was the visit of the Marquis de Lafayette, hero of the American Revolution. The stupendous celebration cost $20,000, about 20% of the state budget for the year 1825. Cahaba during this period boasted 1,000 citizens—Montgomery about 600. But Cahaba was remote and occasionally flooded, so on December 13, 1825, the seat of government was moved. Cahaba went into decline, but prospered again in the 1840s and ’50s. Dallas County, with its giant cotton plantations, was “the wealthiest in the state” and one of “the top five counties nationwide.” The War ended that. From 1826-1846 Tuscaloosa was state capital. It surprised me to learn that the first white inhabitant of Tuscaloosa was–almost—Davy Crockett. He meant to settle here in 1814, but his horses escaped in Jones Valley, he fell ill chasing them and, after being nursed back to health in Bessemer, returned to Tennessee. Tuscaloosa grew anyway. The population in 1820 was about 6,000 white and 2,300 black. A traveler, William H. Ely, reported of the inhabitants in 1821 they were “thoughtless in their dress” and “prone to heavy drinking.” The teachers were “ignorant and immoral.” Much of the white population was “extremely indolent,” “too lazy to work or even think.” Lewis notes Ely was from New England.